This is Bellatrix, aka Trixie. She’s four years old, and although she’s really pretty she’s actually a moggy. We think her dad might have been a Nebelung. We discovered that when someone we know got a Nebelung Cat as their Patronus on Pottermore. When we looked it up, we had to do a double take! They look just like her. She’s the most adorable and annoying cat I’ve ever come across. She has such an attitude, she absolutely loves the two of us, and she absolutely hates everyone and everything else. If you ask my friends and family, they’d say Trixie is evil. They never believe us when we say that she is so affectionate, sometimes even dog-like, following us wherever we go and snuggling up with us when we’re sitting on the sofa or when we go to bed. When visitors come over, whether she’s met them once or 100 times, she’ll hiss at them and bite their feet. She loves our dressing gowns, always purring when she snuggles into us when we wear them. She also loves high up places (including the top of doors) and uncomfortable-looking spaces like most cats do. She’s never given us a dead bird or mouse (yet) and she’s ALWAYS coughing up furballs (they do not look like balls, by the way. More like slugs). She hates any doors being closed in the house, and will beg for them to be opened, even if she doesn’t intend to go through them. And if we leave a wardrobe door open you can guarantee she’ll climb up our clothes and sit herself in the tiniest of gaps in the shelf at the top. We have to make sure she’s locked out when we go into the loft because it turns out ladders are no challenge at all, and for some reason she associates the kettle boiling with treats, despite the fact we’ve never encouraged this. Last year, we didn’t bother putting up our Christmas tree because we knew she’d just climb it every night and wake us up (plus, we discovered our lights were broken and decided humbug was the way to go). When she’s outside and we need to get her back in (she doesn’t have a cat flap) we just call her and she comes running. 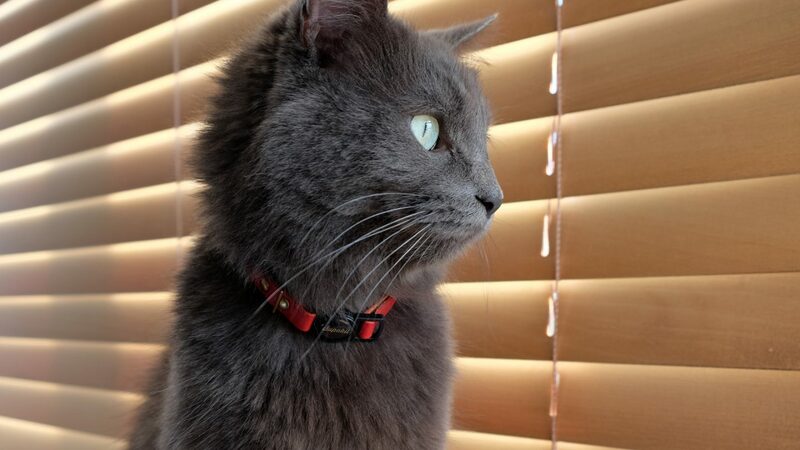 In the photo above you can see she’s wearing the cutest little Supakit collar ready for her outdoor adventures. It’s the breakaway kind, too, to make sure she doesn’t strangle herself on a branch or something which wouldn’t be so great. It’s the collar that inspired me to write this, because the lovely Leili from Supakit reached out to ask if Trixie would like one and I realised I’ve never really talked about her on the blog before. We had to take the bell off of the collar, though, because it turns out Trixie is scared of bells. She absolutely LOVES torches, though. It’s the one thing she’ll go mad for and just doesn’t get bored of. She would chase the light of the torch for hours if we let her, but I think that would be a little bit cruel. She still hasn’t worked out that no matter how hard she tries, she can’t catch the light. Poor thing. So, there she is. Our mad little cat in her stylish Supakit collar. Have you got a cat? Or any other pets? Let me know and share a picture in the comments below or on Twitter. Disclaimer: This is not a sponsored article, but Supakit did send me the collar free of charge. However, I was under no obligation to write about it. I chose to because I thought it was adorable!